Edward Copeland's Tangents: "Money won is twice as sweet as money earned." So if Paul Newman in the The Hustler was the epitome of cool, then Tom Cruise in The Color of Money is surely the opposite. Cruise, at the time, was an actor so grating that he could single-handedly take all of the fun out of a movie. Look, I’ve never been one to hate on Tom Cruise because of his celebrity and other aspects of his life that are well documented; however, in the ‘80s, he was an actor who strained too hard, and the juxtaposition of the old pro Newman out-classing and out-acting the young buck Cruise could have been some clever, postmodern casting job by Scorsese, but I just think it’s a film cashing in on the most popular actor of the ‘80s. It’s an interesting dilemma because we’re supposed to be annoyed by Vincent (Cruise), and they certainly picked the perfect actor for that, but I can’t help but think that the return of “Fast Eddie” Felson to cinema is a touch tarnished from having to share so much screen time with the decade’s biggest star. The film picks up 20+ years after “Fast Eddie” Felson (Newman) “had the screws put to him.” One day he’s talking-up a bartender friend of his (selling her whiskey, which is his job now), and he hears “a helluva break” by hotshot pool player Vincent. As Eddie observes, he notices that he is under the watchful eye of his girlfriend, wannabe hustler Carmen (Mary Elizabeth Mastrantonio). The two hit it off and decide to be business partners, using Vincent’s brashness to hustle their way to Atlantic City for the 9-Ball tournament. 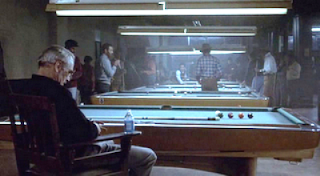 Right away there’s a difference between the two films as the opening (Scorsese in voiceover) explains the rules of 9-Ball — a game that Eddie isn’t used to playing. Unlike its predecessor though, Scorsese is much more interested in making the game of 9-Ball and the central metaphors for the film so blatant that we cannot help but assume the director thinks we’re too stupid to figure it out on our own. Part of the problem with The Color of Money is that it’s really one of the first big, mainstream films with two big-time actors that Scorsese would make; therefore, there seems to be a sense of urgency to oversimplify things. The film’s heart is in the right place as it tried to be like its predecessor in that it isn’t interested so much in the clichés of the sports film as it is human nature (“You study the watch; I study you” is one Eddie’s best lessons to the young Vincent); however, the film’s central conflict ultimately feels flat (especially in light of my recent viewings of The Hustler because it does indeed fall prey to the tired old cliché of the old pro versus the young up-and-comer. Inevitably one will compare Eddie's two primary antagonists, and as much as we hate Vincent (more for the annoying performance by Cruise), he’s no Minnesota Fats. That’s one of the main problems with The Color of Money: we don’t nearly care as much about this version of Eddie’s quest. At the end, Eddie is once again faced with the dilemma of character. When Eddie wins his match against Vincent in the 9-Ball Tournament, the victory is bittersweet. After Eddie takes a brief moment to himself to yell a cry of celebration (a nice little moment), it comes to an end when Vincent tells Eddie that he deliberately lost their match because he bet against himself. A move that “Fast Eddie” appreciates because it’s smart — something he didn’t think Vincent had in him. What it also does it reignite the competitive nature of Eddie. At the end of the film, Eddie and Vincent play for pride the way Eddie and Fats played at the end of The Hustler. And it left me with being of two minds about the film: On the one hand, I love seeing Newman reprise my favorite role of his; on the other hand, the primary metaphor/conflict of the patient, older guard (wanting big picture payoffs) versus the prevailing dogma of the ‘80s (the Me Generation — Vincent even wears a shirt with his name on it — that wants pride over big money) feels too heavy handed at times and takes me out of the movie. I’ve never really felt like I’m watching something that quintessentially is Scorsese when I watch The Color of Money. 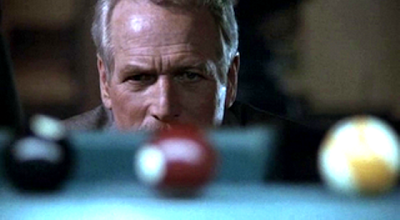 However, and this is why the film deserves to be seen again upon its 25th anniversary, the performance does feel quintessentially Paul Newman; it’s cool, collected and just a helluva lot of fun to watch this old pro go to work scene after scene. The Color of Money is entertaining when it’s being a road picture instead of a derivative drama about the old versus the new; it’s at its best when we see it for what it really is: a story about a man’s soul being fed. Selling whiskey — “You’re sittin’ in it, and I’m wearing it” — has been very good to Eddie, but as he explains later in the film, “it’s tired.” Vincent awakens within him a chance to atone for 20 years of dormancy in the pool scene; a scene — a vocation, really — that truly defines Eddie and that gives him the most pleasure. The most surprising thing about the movie is the lack of energy — especially for a 1980s Scorsese movie — especially when compared to the less flashy but more stylistic The Hustler. This seems like one of the lesser Scorsese films. There are moments near the end where Scorsese show his natural flair for dynamic aesthetics as his camera whirls around the pool table and slams into the corners as the camera takes on the POV of the cue ball or pool stick. It’s less effective, obviously, than what he did in Raging Bull, but he’s still going for the same effect: to put us so in the moment that we can’t help but feel exhilaration while watching it. The funny thing is, I felt more exhilaration watching the considerably more toned-down, prosaic pool scenes in The Hustler with their laid-back aesthetic and jazzy musical score, and if it weren’t for Newman reprising his role as “Fast Eddie,” there wouldn’t be much to talk about here. The film isn’t without its pluses, though. Aside from Newman’s Oscar-winning performance, one of my favorite things about the film is a scene near the end when Eddie walks into his cathedral (with organ music, to boot) of perfectly arrayed pool tables — as the camera starts high and begins to swoop down over the pool tables in a nice visual nod to King Vidor’s The Crowd where the camera makes a similar move as it goes through a building and swoops down on office work stations. It’s a great moment for the character and for the audience, and it’s really the first time all film that we feel that kind of excitement from a shot or series of scenes that we’re used to getting from a Scorsese picture. There’s a brief moment where Eddie starts waxing poetic about straight pool versus 9-ball, and it’s really the first time the film gets going and gives Eddie something to do; it’s the first time we get to see “Fast” Eddie instead of the old man who is constricted by the script’s clichéd limitations of him being the old codger trying to upend the young buck. For Eddie, by film’s end, it once again comes down to character. There’s a satisfying ending to Scorsese’s film even though we’re deprived of the final match between Eddie and Vincent; I’d like to think that the Eddie at the end of The Color of Money doesn’t need to go back to selling whiskey. I am certainly not one to defend Cruise's acting at this point in his career and agree with much of what you say but I think that Scorsese knew exactly what he was doing when he cast the actor and got this performance out of him. I think that the key to Cruise's performance is a crucial line that Newman's Felson delivers to Vincent: "I said you *are* a natural character; you're an incredible flake. But that's a *gift*. Some guys spend half their lives trying to invent something like that. You walk into a pool room with that go-go-go, the guys'll be *killing* each other, trying to get to you. You got that... But I'll tell you something, kiddo. You couldn't find Big Time if you had a road map." It is Cruise's job to come across as an arrogant flake of a human being, which he does oh so well in this film. And I think that this is done to show how radically things have changed in the game and the people who play it since Fast Eddie was knocking the balls around. 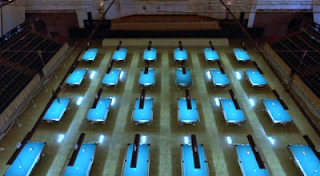 Much of the film is about how things have changed and how Fast Eddie has to adapt, learn, like that scene where he and Vincent go to a pool hall and it turns out to be closed. That's another key scene in showing how out of touch Fast Eddie is. So, is Vincent supposed to represent the future of the game? I would say that his attitude towards things does. Also, there's that bit where Eddie talks about how the players' vics have changed over time. For him, it was booze but with Vincent's generations it's drugs. We see Fast Eddie's guy (played wonderfully by John Turturro) is a cokehead and so on. So, I would argue that THE COLOR OF MONEY is much more than just a crass casting of two big stars and Scorsese making a simple paycheck film. Sure, he made it to prove to the studios that he could earn them money but he also invested a lot of creativity into it and certainly gave it his all and made it as interesting as he could. Is it better than THE HUSTLER? Certainly not but I still feel it is a worthy sequel. But I would argue, J.D., that this is a prime example of lesser Scorsese (which is still better than most movies). The only movie of his where I can truly remember thinking so much about the plot upon my first viewing was The Departed, another film of his I'm not too fond of because he lets the actors trump everything he else he's trying to do in the film. The Color of Money is still a move I return to often; It just doesn't age particularly well because of how bad Cruise was at that time. Newman is timeless, but Cruise in the '80s will always be Cruise in the '80s...and for me, it takes me out of the movie. I think Ebert said it best in his original review when talked about how it was the only Scorsese movie he had seen where he was aware of the plot just kind of chugging by. I agree with that assessment. The movie is not without its charms or its moments visually, but if it weren't for Newman's performance, I wouldn't really think about returning to the film as often as I have. I will end with this: I like the quote you mention. I almost included it in this piece to talk about why the casting of Cruise ALMOST works...I just think there could have been better actors to portray Vincent...actors that were more in the Scorsese mold. Cruise is about as out of place here as Nicholson was in The Departed. I'll admit that I've never felt the need to re-visit The Color of Money after I saw it the first time 25 years ago, but I always saw it as Scorsese working for hire so he could finally get Last Temptation of Christ made. As for The Departed, I'm going to defend it dammit. I loved it the first time and if I stumble upon it on TV, even cut up, I can't help but watch. It's endlessly re-watchable. I had seen Infernal Affairs first and some of the twists still took me by surprise. Of course, Jack was in over-the-top mode, but not the movie's detriment as say De Niro was in Scorsese's Cape Fear remake, where he managed somehow to make a film better than the original at the same time the Max Cady was an embarrassment when compared to Robert Mitchum's original.